"Imagine The Possibilities" Frank Moore Write-In Candidate for President 2008 Campaign Stop in San Francisco! Another amazing day on the campaign trail! 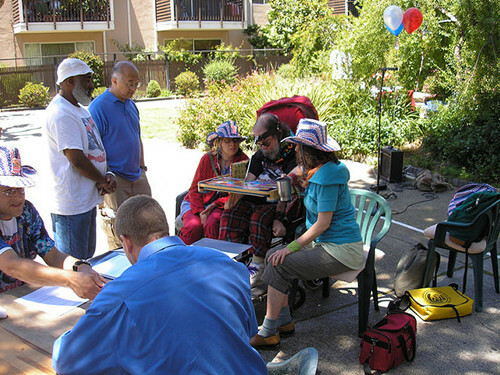 Saturday I spoke in the square of a large co-op community in San Francisco...signing up electors and exploring the issues in very deep discussions. Carl was waiting at the entrance to the parking lot when we arrived ... we got there at about 9:15. We drove down and he showed us the office, and we helped us unload, and start to put stuff up before he needed to go set up the hotdogs, etc. It was a set-up challenge without the tent routine we were used to, with its ready-made places to attach everything, but such a beautiful location. We scoped out spots for the swag, for Frank and the speech location, and set David up right next to Frank, in the only place we could see that there might be shade througout the day. It was so great that it worked out! We were hustling! At about 10:30, a couple of older women arrived in the office just as Corey was about to start blowing up all the balloons. It turned out they had a meeting scheduled in there, which the moderator said was very important, and it wouldn't work very well to have too many distractions. It turns out that they are a grounds & buildings planning committee for the Square, and were discussing a major painting project on all the buildings. Corey told her that all he needed to do was to blow up the balloons inside so that he could blow them all up and they wouldn't fly away. She said ok, if I get a balloon!! Corey said ok! He ended up blowing them up outside because the helium tank was loud, and then would carry them inside and tie the ribbons on them. Once he had put up all the balloons, he carried one red balloon over near their meeting table, and indicated to her that it was for her, and she probably thought that it had been a joke between them, but was happily surprised to get the balloon! Then you guys were off, and we were breaking down the set ... always a trip to see the site of a FM4Prez event morph back into its original state. Carl helped us pack everything up, and he distributed balloons and hotdogs to folks around the square. We gave the flowers to Carl, which he really liked, and he took them up to his apartment, to Tammy, saying, "Now she can't say I never give her flowers!" Mike was back again to lock up the office, and he said, "Good show, guys." We hugged Carl goodbye, and soon were on the road. We were wiped! Pleasantly wiped! Last modified July 30, 2015. This site is designed and maintained by Michael LaBash Graphic Design.